While most sane cricketers were still tucked up in their beds, 7 of the more insane players made the short drive to Henfield CC to partake in the second annual Sussex Cricket Foundation 6 a side competition. The games are played over 5 overs, utilising 5 bowlers, where wides and no balls are worth 3 runs. Opposition included Findon, Hurstpeirpoint and a Henfield “A” and “B” side. 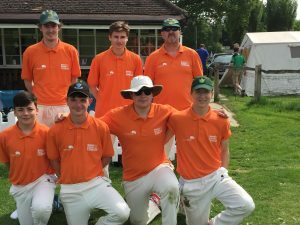 Hill donned the orange shirts, and were in action second game of the day vs Henfield “B”. Bowling first, Hill were put to the sword early by some lusty blows, and some wayward bowling, which resulted in the target being a very impressive 68. In response, Hill finished their 5 overs on 45, Punter top scoring with 24. In the second game, Hill batted first Vs Hurstpierpoint, and succumbed to some good bowling, but mainly poor shots. Hill were bowled out for 28, but a spirited reply led by skipper Pete Murphy gave Hurst a scare, having them 3 down in the first 2 overs. One of these wickets was courtesy of a superb run out by Niall Murphy, who was exceptional at cover. However, the Hurst batsmen then batted sensibly to reach the target with time to spare. A 2 game break then followed, which allowed Hill to dig into a superb barbecue, and enjoy some beautiful bank holiday sunshine. Murf Snr stood himself down for the 3rd game for Hill, where we played Findon. Murf Jnr took the captaincy for this game, and Hill built a respectable total batting first. Punts and L. Mamoany opened up, and 15 runs from each plus some wayward bowling helped Hill score a competitive 59. A superb bowling effort from everyone then followed, but the standout effort was Joe Hartley, who was exceptional behind the stumps, taking 2 run-outs and a stumping. Immediately after, Hill were in the meadow vs eventual winners, Henfield “A”. This strong outfit scored a massive 62, and were able to manage this because of some average bowling and dropped catches. Dan Rapson dropped 2 catches in consecutive deliveries off Murf Jnr. In reply, Hill scored a modest 44, Punts top scoring on 18, and Niall Murphy scoring 14. However, a collapse ensued, with Tom Booth nicking off the forth ball in the final over and Rapson, facing his first and only ball of the day, missing a straight one going for the big Yahoo, leaving “A”s on a Hattrick. Murf Snr successfully negotiated the final delivery of the over, and Hills’ fate was sealed. Congratulations to the competition winners and hosts Henfield “A”, and an extended thank you to the organisers, umpires, barbecue attendants and those who came to support. See you all next year!